Forklifts and mobile machinery used in warehousing, forestry, agriculture and construction are a notorious cause of accidents in New Zealand. Worksafe NZ recorded that of 55 total fatalities listed in 2013, 2 were crushed by forklifts and 8 were struck by mobile plant/equipment. 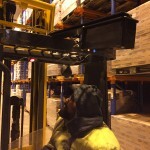 The number of forklift injuries each year is unknown, but overseas stats indicate risks are high. So too are the penalties. Worksafe NZ reported in August 2014 that three companies had been fined almost $120,000 and ordered to pay combined reparation of $20,000 after a woman was struck by a reversing forklift at a kiwifruit pack house at Mount Maunganui. In this case WorkSafe NZ recommended that barriers be put in place to prevent the forklift from moving into the tray makers’ area. While it seems that barriers would have prevented this accident, it is often necessary for pedestrians and machinery to share a working environment and barriers simply aren’t practical. Fortunately there is a solution and it is available through and supported by Shockwatch NZ, who are exclusive agents for class leading damage prevention products from around the world. HIT-NOT® is the most precise and reliable equipment-to-pedestrian collision avoidance system on the market. Unlike RFID Systems, HIT-NOT® does not have to see you to know you are there – it uses low frequency magnetic fields to read and warn through walls, racks and other blind corner obstructions that cause life changing injuries and sometimes death. It is a precise marker with two zones, Warning and Danger, which are indicated by an LED light and audible sounder for the pedestrian and equipment driver simultaneously. HIT-NOT®’s fully proven technology was initially developed to save lives in the Mining Industry. HazardAvert® was the first proximity detection system approved by MSHA (Mining Safety & Health Administration in the US). HIT-NOT® utilizes the same powerful technology to save lives and eliminate vehicle-to-pedestrian collisions in the workplace. As was the case in the pack house at Mount Maunganui, the developers of HIT-NOT® discovered that forklift accidents commonly occur while the truck is reversing – as the operator does not have the full range of vision, especially if he is also managing a load on the front of the truck. They also found that RFID systems were being ignored because they gave off too many nuisance alarms that were not in fact an indicator of any real or immediate danger. In order to solve these problems, HIT-NOT® warnings alert pedestrians and operators only when they are in dangerous proximity to each other. Precise safety zones are provided all around the trucks, being longer in the front and rear than on the sides. Silent zones can also be programmed to mute the alarms in situations where pedestrians are known to be working in a safe location. Shockwatch NZ is a privately owned company offering equipment monitoring and safety products plus temperature/impact monitors and tapes to protect goods in transit and through the supply chain.